Home > Law Books > Treatises > New York Examination Before Trial and Other Disclosure Devices, 2018-2019 ed. 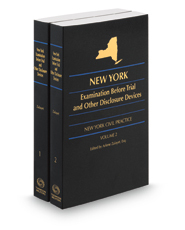 New York Examination Before Trial and Other Disclosure Devices, 2018-2019 ed. New York Examination Before Trial and Other Disclosure Devices analyzes the general purpose and scope of disclosure under New York's Civil Practice Law and Rules. It addresses actions permitting disclosure, trial preparation materials, examination procedure, discovery and inspection, examinations and records, penalties for nondisclosure, and use of depositions. The set covers pretrial examinations for approximately 35 types of actions, with sample questions and practical suggestions to maximize disclosure benefits. Hundreds of pretrial examinations in more than 30 types of actions are discussed.